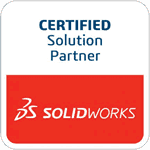 This quick time saving tip will show you how you can use alternate unit types in SolidWorks. Here we have an Adjustable Bracket. Sketch 1 of the part controls the length of the part. As you can see the length of the part is 10 inches. Let’s say you are told that you need to change the length of the part to 300 mm, but you’re not sure how long that is in inches. One way to handle this would be to change the Units Type for the file to Metric. Then you could change the dimension and change the units back. There is a much quicker way though….